THE quality of patents at the Office of Benoît Battistelli is as high as the quality of the lies of Benoît Battistelli. This Liar in Chief continued lying today; he spoke about patent quality yet again. He has lost any sense of shame and he now lies so blatantly that we can imagine the faces of EPO workers who read this ‘blog’ post of his (warning: epo.org link). It was promoted in the Organisation’s Twitter account some hours ago. “In a new blog post President Battistelli reviews 2017 and discusses the year ahead with a strong focus on quality,” it says. They too are lying. Yes, the Organisation. Does Herrnst care at all? Probably not because a few months ago he help defend the same lies about patent quality (in a private event that was publicly reported on). We suppose that a rebuttal to these lies is in order because staff must have noticed these lies. Someone ought to respond to the lies. So Battistelli controls everything, even things that are tasked with assessing his performance. Amazing, isn’t it? Not at the EPO anyway; this has become the norm and something to be perpetually expected. Is anyone out there surprised about it? Battistelli is moving his lips again, having returned from his (longer than other staff’s) break. His lips utter words, which leave an odorous puddle of lies afoot. “Battistelli is moving his lips again, having returned from his (longer than other staff’s) break.”Let’s look at the latest evidence of a decline in patent quality (as the EPO itself is unable to safely investigate the matter; staff representatives who merely brought up the subject were severely reprimanded by two Vice-Presidents). Introspection verboten! The European Patent Office (EPO) and the Canadian Intellectual Property Office (CIPO) have extended a patent prosecution highway (PPH) pilot agreement. For those who are not familiar with the concept, PPH will almost always guarantee lowered quality of assessment (and less time for oppositions etc.) in the name of speed, usually in order to better facilitate a patent aggressor rather than a defendant. Comparatively, the CIPO received 406 requests: 325 based on PCT work products and 81 based on regional work products. Yes, “products”; Battistelli probably thinks that he is literally running a factory (something which he never did before by the way). In the ongoing opposition proceedings at the European Patent Office (“EPO”) concerning Cantargia AB’s (“Cantargia”) patent for antibody treatment against IL1RAP in solid tumours the EPO has informed the company that the oral proceedings that were due to take place on 22 January 2018 have been cancelled. Oppositions? What oppositions? The EPO cannot even keep up. Understaffed. Brain-drained. Total chaos. “The EPO now grants far too many patents in error.”Great job, Battistelli! Given the EPO opposition term of nine months from grant and given that by far the greater proportion of oppositions are filed towards the very end of the opposition term, increased grants could be expected to be followed nine months – three quarters of a year – later by an increase in the number of patents opposed. 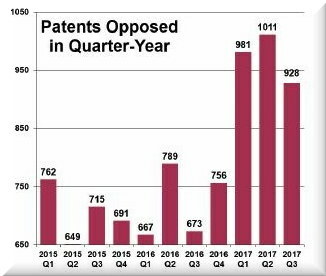 Though the record of the number of patents opposed in the third quarter of 2017 is not yet finalized, it seems clear that this expected “more patents opposed” effect has occurred. At the latest from the first quarter of 2017 there has been a marked increase in the number of patents opposed. We are truly concerned that Battistelli basically ‘broke’ the EPO; everything that had evolved at the Organisation (and Office) to assure checks and balances, self-assessment etc. is now gone. When we publish old documents from staff representatives we gradually go back in time and show how Battistelli did it, scuttling everything that constitutes separation of powers. It’s disturbing. And it’s a good thing that some people meticulously documented these things over the year. The German Federal Court of Justice (FCJ), however, applies in the recently published ex-parte decision “Phosphatidylcholin” a different reasoning. In the case the FCJ had to decide upon an appeal on points of law (“Rechtsbeschwerde”) of the applicant of a patent application, which has been rejected both by the GPTO and the Federal Patent Court based on the ground that of an undisclosed disclaimer consisted of an inadmissible extension beyond the content of the original application. We previously posted evidence that GPTO (in relation to SLAPP, trolls, and quality of patents) had become better than EPO. Where is the EPO going if the Boards of Appeal are being crushed (and shrunk) further and further? Who is going to independently assess patent quality?